X-904 Refurbishment, Billy Pugh Co. 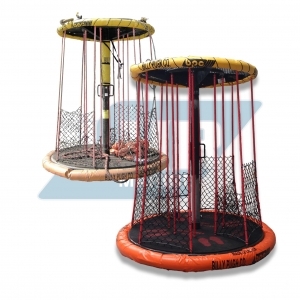 The X-904 is manufactured with a variety of components such as wire rope, synthetic rope, floatation, cover materials etc. All of these components are affected by the harsh offshore environment they operate in. This wear would include general wear and tear, UV degradation as well as the salt water conditions offshore. These effected parts are all critical in the performance and operation (and most importantly) the safety of the X-904. The X-904 is aged by the In Service Date which is the date the X-904 is removed from its packaging. It should be inspected before each use then have a more thorough inspection every 6 months and be refurbished every two years (with the understanding that it had passed the daily and 6 month inspections). The two year refurbishment helps to insure that these devices are more than ready to do the job that they were designed for…Why two years? Because Billy Pugh have found that on average (based on over 50 years of manufacturing safety equipment for offshore use) two years in the field is the maximum time that we can recommend these type devices operate without these critical parts being replaced.